Dangerous liaison : the inside story of the U.S.-Israeli covert relationship · One Book. One Author. One Hour. page 3-Israel 1/4 of funds from U.S. 1. When did foreign aid begin; 2. Czech link for arms; 3. Lehi-Sharmir, Irgun-Begin, Haganah, Palmach, Mapam, Mapai; 4. James Angleton --memorial near Yad Vashem. Uyi, Galil, Noriega/Harari 245, Bush connection--Gregg-Rodriegos, Supermarket, Jonathon Pollard-page 203. Beachfront hotels, Tel Aviv. "Philadelphia--Mitzvah". 980 pilgrims. Gideon Levi, Ha'aretz thought firepower demonstrations for visiting Americans appalling, a show to raise funds--$1 billion in private donations to Israel. US gov't--$4 billion in military/economic aid--$6 billion a year, $1,300 for each Israeli. Israel's gross national product $24 billion a year, 1/4 of income from gifts from US citizens. Israeli security system unknown to outsiders--chronicled in Hebrew press, rarely translated into English. Sibat--Mossad headquarters. David Kimche left government in 1985, works for Eisenberg. Shaul Hamalekh as instructive to visit as Masada. Yad Vashem, beyond memorial forest, plaque: "James Jesus Angleton, 1917-1987. In memory of a Good Friend." Most founders of Israel born within 500 miles of Minsk. Poalei Zion, Zionist echo of Communist Manifesto. Anticapitalist concept of collective farming. Jewish Agency, functions including fund-raising. David Ben-Gurion, atheist. Money, from US. Service Airways, Jewish/American arms smuggler--Al Schwimmer. Mayor Teddy Kollek. Money & Truman--1944 vice presidential campaign financed by wealthy Zionist, Dewey Stone. Ed Kaufman. 2 million dollars went aboard Truman train--paid for state of Israel. Fred Grunich--American Zionist. Ben-Gurion asked if presence of foreign espionage officer in Israeli General Staff headquarters of army/passing of secret information to foreign power treason? Ben-Gurion wanted Israel aligned with the West. Mossad, Shiloah put in charge. Gold--secret file of Israeli agents/sympathizers. CIA from Office of Strategic Services--Republican lawyer, William Donovan. Roosevelt needed Republicans like Donovan who wanted US to enter the war. General Reinhardt Gehlen paid $100 million by 1955 by US. Zionist Jonathan Pollard, worked in US naval intelligence while spying for Israel. Victor Ostrovsky. May 1951--Ben-Gurion trip to US to raise funds; trip to Washington Israeli intelligence enlisted in service of the CIA. Angleton contact with Israeli intelligence after WWII. 1951 Agleton official CIA liaison for all Allied foreign intelligence agencies--operated outside normal channels. Communism was Angleton's dominating obsession, essence of evil. Uzi Gal, born 1926, moved to England to avoid the Nazis. Israel Galil, Galil automatic rifle. 120,000 Israelis work in defense, 1/4 Israeli families depend on defense jobs. 1984 Jonathan Pollard assigned to Anti-Terrorism Alert Center (ATAC), of Naval Intelligence Service's Threat Analysis Division. "Security system" runs Israel's defense affairs/business. Harari worked on behalf of US government to facilitate passage of arms to contras, according to Panamanian officials, too important to touch. Jose Blandon defected to US, present at two 1985, secret meetings between Noriega/Oliver North. Harari part of Noriega cocaine business. Donald Gregg. Mike Harari escaped to Israel. Three weeks after US invasion, Harari denies relationship with Noriega on Israeli TV. When Congress cut off military aid to Guatemala in 1977 and dictatorship of Smoza in 1979, Israel picked up slack. 1991 Israeli bombs Iraq. "Have Nap." desert boots worn by US ground forces were made in Israel. American Patriots caused as much damage as Saddam Hussein's explosives. Israel fiercely anti-Communist. 1989 75% of Israeli defense production=export; earns $1.6 billion in sales--faced by threat of peace. Iraqi army not demobilized. Under George Bush, Israel found atmosphere more silly than days of Al Haig/George Shultz. Missile landed in wealthy suburb of Savion, one block from Aren's house, [p. 360] List: Ha'arety, Jerusalem Post, Frontline, Sharon-roses, National Security Archive, Freedom of Info. A, Buchannan-Amen corner. Hebrew-language press=window into Israeli-Jewish society. Ha'aretz more informative than Jerusalem Post. Most interesting materials must be translated from Hebrew. Diaries of Moshe Sharett, Isser Harel, Israel Lior. Noam Chomsky. 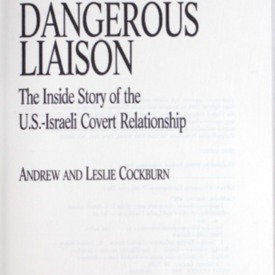 Cockburn, Andrew and Cockburn, Leslie, “Dangerous liaison : the inside story of the U.S.-Israeli covert relationship,” One Book. One Author. One Hour., accessed April 24, 2019, http://booknotes.gmu.edu/items/show/206. Program air date: September 1, 1991. Andrew and Leslie Cockburn's study of the intelligence relationship between the United States and Israel.